Some men may credit their success to hard work, their own brains or to their mother. But not artist Ernie Bushmiller. the Post-Dispatch comic pages and keep her creator in a style to which he was never accustomed. "When I first drew Nancy into a comic strip, it was just as an incidental character and I planned to keep her for about a week and then dump her," Ernie groans when he remembers how he contemplated this cruel act of child-abandonment. "But the little dickens was soon stealing the show and Bushmiller, the ingrate, was taking all the bows." Today Nancy is appearing in 450 newspapers with 21 million circulation and, in a recent poll, the black-haired little imp with the bangs and shoe-button eyes led all the comics with a readership of 70 per cent. She appears in 23 foreign newspapers and is evidently as fetching to the folks in Japan and South Africa as she is to her fans in New York or St. Louis. "The nice thing is that Nancy and her various pals, such as Sluggo, are favorites with parents and teachers, as well as with children," says Ernie. "Nancy and Sluggo may be brats, but they're nice brats. They don't play with meat choppers or anything like that." Bushmiller wasn't setting the world on fire when Nancy popped out of his ink bottle one day and came to life under his drawing pen. In fact he had only a small brush fire going in the way of a comic strip called "Fritzi Ritz." Born Ernest Paul Bushmiller, the son of a fairly prosperous New York insurance salesman, Ernie managed to get through grammar school and bravely stuck out six months of high school, but he didn't feel that education was doing much toward getting him on in the world. So at the age of 14 he tossed his books into the nearest ash can and got himself a job as copy boy on the Old New York Evening World. "I remember I got nine dollars a week on the World, but because I was a copy boy in the art department, I'd have paid them nine dollars, if I'd had it, just to let me hang around," Ernie laughs. With his nine dollars a week, Ernie managed to attend the National Academy of Design at night. By day, between running errands, he tried to impress oldsters around the World art department with his knowledge of drawing. He remembers that his first labor to see the light of print was a crossword puzzle. Ernie lettered his initials into the corner and carried the thing around in an inside pocket for weeks. Finally, he got a whack at illustrating magic-man Harry Houdini's puzzles in the Sunday World Magazine and a year or so later, when World artist Larry Whittington dropped a comic strip called "Fritzi Ritz," Ernie was promoted to the job of keeping the strip going. Along about 12 years ago, Ernie, at his wit's end to keep "Fritzi Ritz" fresh introduced Nancy as Fritzi's niece. He had intended keeping the little moppet with the black sponge of hair topped with the little white ribbon in the strip only a short time, but like the man who came to dinner, Nancy who was invited only for a short stay, moved in for a lifetime. "And," says Ernie happily, "she brought the bacon with her." "It is possible that 'Nancy' is the best comic today, principally because it combines a very strong, independent imagination with a simplification of the best tradition of comic drawing. 'Nancy' is daily concerned with making a pictorial gag either about or on the affairs of a group of bright, unsentimental children who have identical fireplug shapes, two-foot heights, inch-long names (Sluggo, Winky, Tilly, Nancy) and genial, self-possessed temperaments. "This comic has a remarkable, brave, vital energy that its artist, Ernie Bushmiller, gets partly from seeing landscape in large clear forms and then walking his kids, whom he sees in the same way, with great strength and well-being through them." While Nancy started out as a gag vehicle to keep her Aunt Fritzi's doings readable, the lovable little heroine soon had a terrific following. Before long an Owensboro, Ky., editor, enamored of the little girl with the chubby legs and smiling mouth, petitioned the feature syndicate which had picked up "Fritzi Ritz" after the World folded, to change the lame of the strip to "Nancy." The syndicate polled its clients on the.subject and in May of 1938 the engaging little minx moved into the limelight with a comic strip in her own name. Bushmiller hasn't the faintest idea where Nancy came from. He hasn't any kids of his own and says Nancy isn't patterned after any of his relatives or neighbors. When it is suggested that Nancy, in a lot of ways, resembles her creator and that Bushmiller might look a lot like his creation if he combed his hair in bangs and wore a hair ribbon, he says disparagingly: "That's ridiculous. The only thing I resemble is a honeydew melon." Ernie works on a schedule that produces six daily Nancy and Sluggo strips between Sunday and Tuesday evenings. Then he takes Wednesday and Thursday off and then begins work on his Sunday page. "I know a schedule like that sounds goofy," he grins. "And I guess I am goofy. For instance, I'm the only strip cartoonist I know of who draws the last picture and works back toward the beginning." Since Ernie started drawing the snub-nosed Nancy, he has had some strange experiences. Once he drew a strip showing Nancy using vanilla extract for perfume. A grateful vanilla extract manufacturer sent him enough vanilla to last a couple of lifetimes. "I've been trying ever since to figure out how I could get Nancy behind the wheel of a Cadillac convertible," says Ernie. Not long ago, too, Ernie had a letter from a lady fan in Brooklyn who had named her first child Nancy and, about to produce a second which she was sure would be a boy, implored Ernie to give Nancy a new pal in the comic strip. "I just can't," the lady wrote, "name my baby boy Sluggo." Although his red hair is turning gray and he is beginning to thicken about the midriff, Ernie has a boyish grin that belies his 43 years. He has no hobbies but he and his wife do have one pet — a mongrel dog Ernie found in Central Park as a pup. "His name is Fedink," Ernie says, "and you'll have to take my word for it that he's a dog. He might be a Shetland pony for all I know. He's big enough. He's got a face like a fox terrier and a tail like a Collie and one of his legs is strictly Dalmatian." Someday Ernie intends reading some of the classics of literature. "I was," he says dryly, "too busy for that stuff when I was young." He also intends buying an automobile one of these days. He once owned a car which stalled in the middle of the Triborough Bridge. Ernie got out and left it, phoned the garage man and had the man sell it. A simple guy, Ernie says it doesn't take much to make him happy. He hardly batted an eyelash when his syndicate informed him that 170 new papers had subscribed to "Nancy" in the past two years bringing his total to 450 and his income to a sum that would make his home address sound like a substation of Fort Knox. The day Ernie got the news he was carrying around a Japanese newspaper which had just started running Nancy. "Look," Ernie was demanding. "My name in Japanese. Can't you just see that Jap artist beating his brains out trying to write Ernie Bushmiller in Japanese." Thanks to Cole Johnson, who supplied a scan of this clipping from the St. Louis Post-Dispatch. This is part 4 of a 5 part series that they ran in 1949. We will be presenting all 5 episodes in upcoming posts. 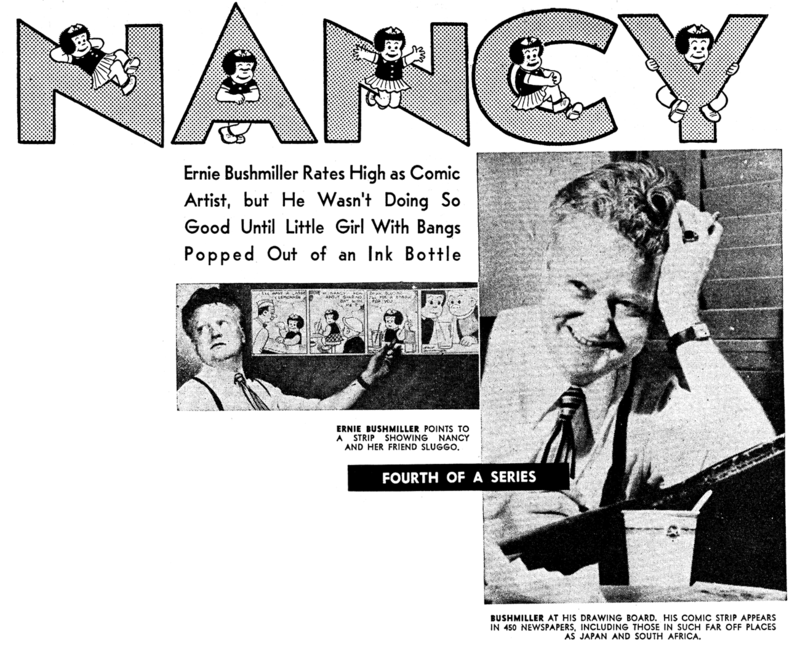 By the way, the uncredited New Republic writer who praises Bushmiller is influential film and art critic Manny Farber. Manny was a mentor of sorts to me in college, and we had many conversations on the genius of Bushmiller.